Disclaimer: These products were provided free of charge by Tip Top Hair Design for review purposes. All opinions are my own and you can find my full disclosure policy here. 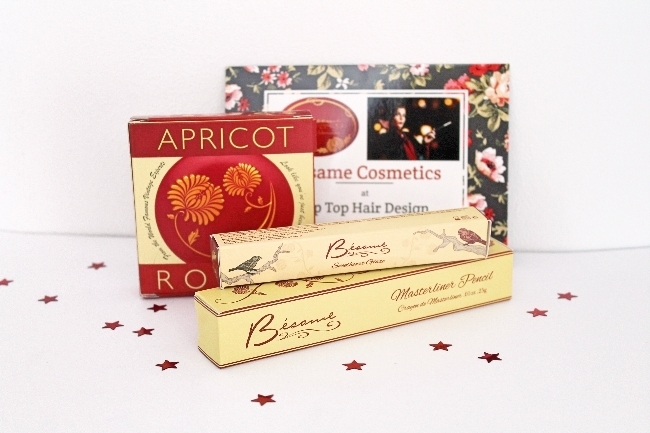 A few weeks ago, Jac from Tip Top Hair Design approached me about reviewing a few of the Bésame products that she's now offering for sale in the salon and on her website. You might recognise Jac's name as I work with her on a regular basis as a model either for the salon or for other companies who have hired Jac to do my hair for shoots. Since I already get on so well with Jac and I know I love the other Bésame products I'm lucky enough to own or have tried out for shoots, I was more than happy to accept. Jac now has some of the newer offerings from Bésame available to purchase, so today I'll be reviewing the Apricot Rouge (1938), Sweetheart Glaze in Cherry, and the new Masterliner lip pencil. The first thing I will say about all of the products is that, as is always the case with Bésame items, the packaging is absolutely gorgeous. I love the vintage look of the products and they look really fantastic if you're like me and keep a lot of your makeup on display. The containers for all the products have a very high quality look and feel - the rouge is a good example because it's in a proper tin rather than a plastic container. 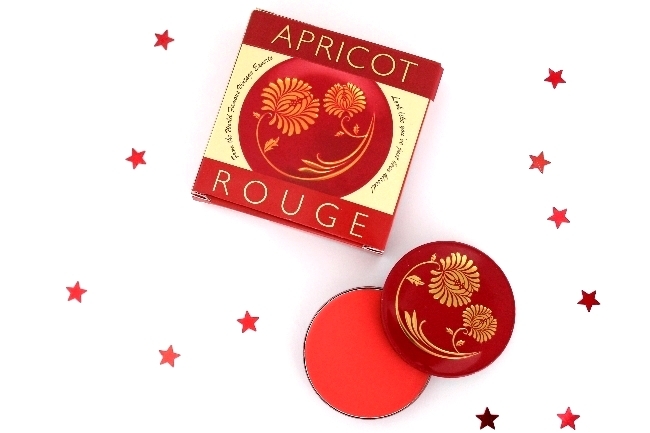 The Apricot Rouge is really pretty and a little bit goes a really, really long way. To apply it, I just tap my finger on the surface of the product and blend it carefully onto my cheeks. A small amount gives a dewy flush to the skin which reminds me of Snow White. The product is easily buildable if you require more colour, but it can easily get out of control if you apply too much. Generally I prefer a very light application to give my skin a pretty "lit from within" glow. I really like how the peachy tones look on my pale skin, and I can see this colour being really flattering on much darker skin tones as well. The only downside for me is that the lid is really difficult to get on and off. I had my brother test this for me as well, to make sure that the difficulty wasn't down to my cubital tunnel syndrome, and he confirms that it is indeed tricky as the lid often seems to get stuck halfway. I am wondering if it will loosen up a bit once I have used the product a bit more. Bésame's rouges retail at £20. The new lip glazes from Bésame are a different offering to the type of thing we've seen so far from this company. 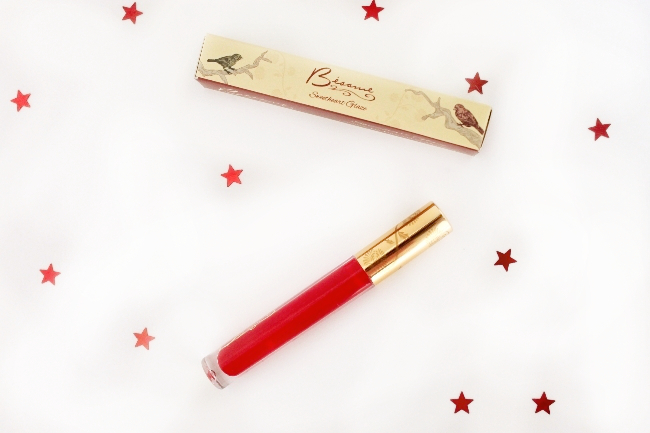 If you're a die-hard vintage girl who won't use lip gloss then this product may won't be for you, although I suggest that you read the rest of my review of it before making up your mind. Given the growing popularity of Bésame amongst mainstream consumers, I imagine the lip glazes are intended more to appeal to the non-vintage market. Personally I prefer to wear lipstick rather than lip gloss, but I do wear lip gloss on days when I'm feeling a bit more casual and low maintenance. The cherry lip glaze comes with a doe-foot applicator and has a reasonable colour pay off for something that I'd definitely class as being a lip gloss. It's also supposed to be very moisturising for your lips which is a nice extra touch if you're someone who wears a lot of lip products. It feels every so slightly sticky when you apply it, but overall I'd say it's much less sticky than most lip gloss-type products. The glazes are each scented to match their name so the cherry one is cherry scented. It's quite a strong scent so possibly something to avoid if you dislike scented lip products, but I can't detect any kind of cherry flavour. I'd say it's quite an artificial scent which reminds me of some scented My Little Pony dolls I had back in the day. I do like the scent, but to me it doesn't smell like real cherries. I really like the texture and look of the cherry glaze, and I do think it has the potential to appeal even to those of you who might not normally bother with lip gloss. This also retails at £20. 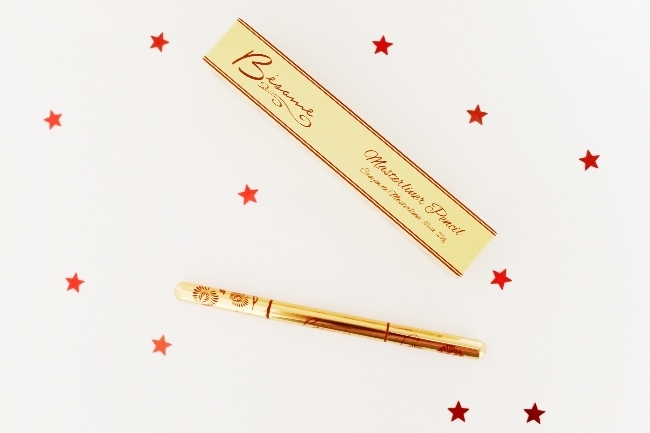 Finally, the Masterliner lip pencil is a great addition to Bésame's line. 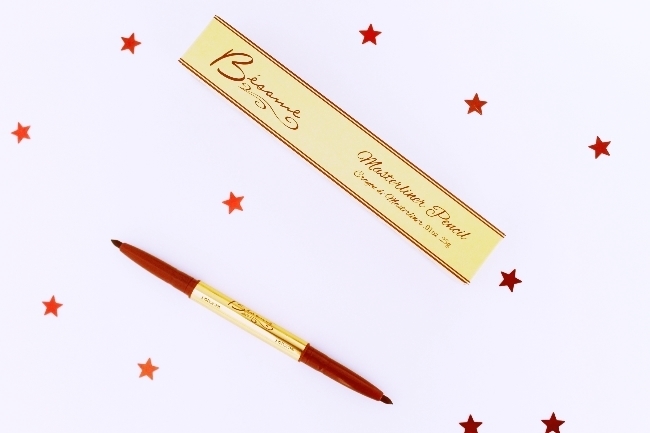 The liner is a double-ended twist-up pencil, which is always great for getting a really neat precise line, and for not losing any of the product through sharpening as with traditional pencils. I found the consistency of the pencil to be very smooth and creamy, so it feels really nice to apply and isn't at all drying unlike some other lip pencils that I own. The two ends of the pencil are in slightly different shades of red, which are supposed to be 'cerise' and 'red' according to Tip Top's website. There are no colour names on the pencil itself though, and it's not completely clear which end is which. I suspect that the darker colour might be considered 'cerise' and the lighter colour is 'red'. It's also not too easy to tell the difference between the two colours of liner just by looking, so I usually make a small mark on my hand with each end to make sure I'm selecting the one that I want. The Masterliner retails at £20. Thanks again to Jac for the lovely things! Thank you for your reviews Helen. I sometimes also struggle with the tin but find if I twist/turn and pull in one motion it's better. I also find if I hold the lid looser it help as It pinches it shut. Great review! These are such splendidly lovely looking products. I've always wanted try Besame's offerings, but they're a bit on the steep side price wise (by my very modest makeup budget's means). One day though I just know I'll take the plunge and invest. 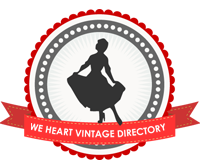 They're too gorgeous and vintage appropriate note to. Have a marvelous weekend, sweet gal!